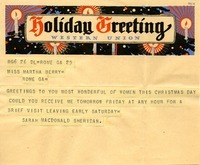 Sarah Macdonald Sheridan wishes Martha Berry, the most wonderful of women, a most wonderful Christmas and asks if she could receive her the next day, Friday, for a visit. 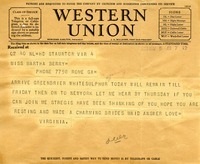 Martha telegrams to see if Mr. McGill could come to Berry in the next few days before she leaves. 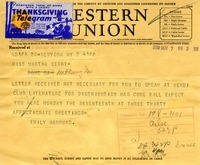 In this telegram Emily Hammond tells Martha Berry that she does not need to speak at Verdi Club and that she is expected to be there Monday the seventeenth at 3:30. 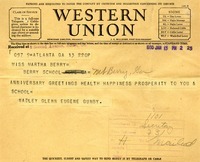 In this letter Gunby sends an Anniversary Greeting for Martha Berry and the School. 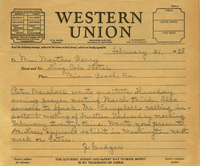 Henry Clark writes to Martha Berry to inform her that due to his new presidential duties at Judson College he will not be able to give the commencement address. 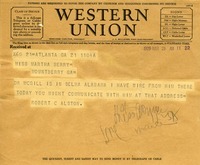 Telegram to Martha Berry from Robert C. Alston informing her that Dr. GcGill is in Selma, Alabama and that she can communicate with him at that address. Emily Hammond asks if Inez could speak, but if there is a chance of Berry speaking she would prefer to postpone the meeting. 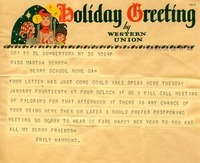 She also offers her condolences for the fire and sends New Years good wishes. 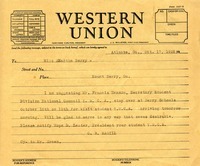 In this letter C.R. 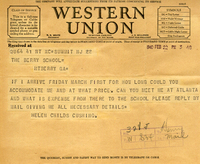 Magill suggests to Martha Berry that Mr. Henson the secretary of the divisional national council of the YMCA stop at the Berry Schools. 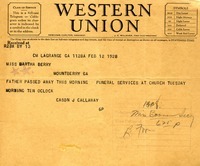 Mr. Cason Callaway sent Miss Berry a telegram stating that his father passed away and the time of the funeral. 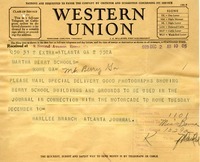 Rosa writes to Martha asking if Martha will give an informal talk on "The Girl in the Making" at the Georgia Education Association meet in April, to which Martha accepts.